Guwahati, 31 May: The Assam Press Correspondents’ Union (APCU) organized a media talk and also a health camp for its members on Monday in the city. Nearly hundred rural reporters from different parts of the State joined in the program and took advantages of healthcare consultations. Journalist Nava Thakuria, while attending the meeting as a resource person, pointed out that the media in India was facing severe crisis of credibility. He however expressed optimism that amidst all the troubles & limitations, the journalists of northeast India would come out as authentic narrators of the situation to their respective reader, audience and viewers. Chaired by APCU president Manoj Singh, the meeting earlier decided to launch an annual award in memory of journalist Budhindra Hazarika, which would be offered to a television scribe. Moreover, the meeting resolved that the death anniversary of journalist Kamala Saikia, who was killed by militants 25 years back, would be observed on 9 August in the city. A history of APCU will be prepared in a book form by senior journalist Shobhit Chetri, where as the next APCU session would be organized at Majuli river island under Jorhat district. 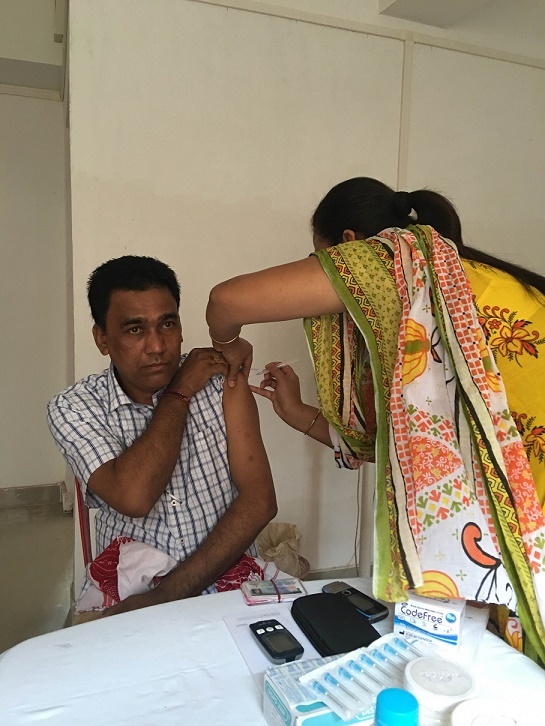 The general health check-up for the participants was sponsored by Assam’s well known Dispur Hospitals, where the second dose of Hepatitis-B vaccine was also administered on the rural correspondents, who received the first dose of the vaccine on 30 April last. The meeting was also attended by Dispur Hospitals Pvt Ltd public relation officer Ujjal Saikia, APCU working president Mousamjyoti Baishya, its secretary general Hemanta Saikia with other office bearers. The forum also extended gratitude to Dr Jayanta Bardoloi, the MD of Dispur Hospitals, for his mission to make journalists across the region Hepatitis-B free. This entry was posted on Tuesday, May 31st, 2016. You can follow any responses to this entry through the RSS 2.0 feed. You can skip to the end and leave a response.